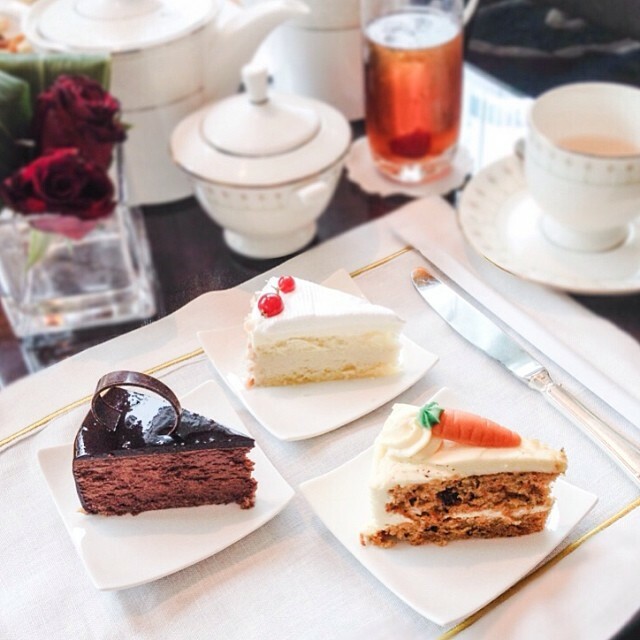 The Shangri-La (there are two, this one is in the city, just off of Orchard) is one of my favourite hotels in Singapore so I’d been keen to try out their afternoon tea for a while. The ‘high tea’ is very popular and is served in the Rose Veranda lounge. The grand sweeping staircase that leads to the Rose Veranda is a good indication of what to expect. There were quite a few of us so we were given a long table right in the middle of things. Low, comfy chairs (maybe a bit too low?) and large tables on which to stack up your plates of goodies. Personally I prefer a round table as it’s more sociable. But, as I say, there were quite a few of us. In the end I chose from the ‘recommended tea’ page and went for a New York Afternoon Tea. It wasn’t great; quite bitter and not refreshing. I asked to change it to an ordinary breakfast tea and was told that this wasn’t allowed – you choose you tipple and you stick with it. However, I must have looked a bit sad as they did change it, so all was good. One of the Handbags and Teabags ladies chose a delicious smelling fruit tea that many oohed and aahed over so maybe I should have been a bit more adventurous? Delicious dim sum and pork buns. On to the food – wow! The selection was amazing. In fact, it was more like a full buffet lunch than an afternoon tea. 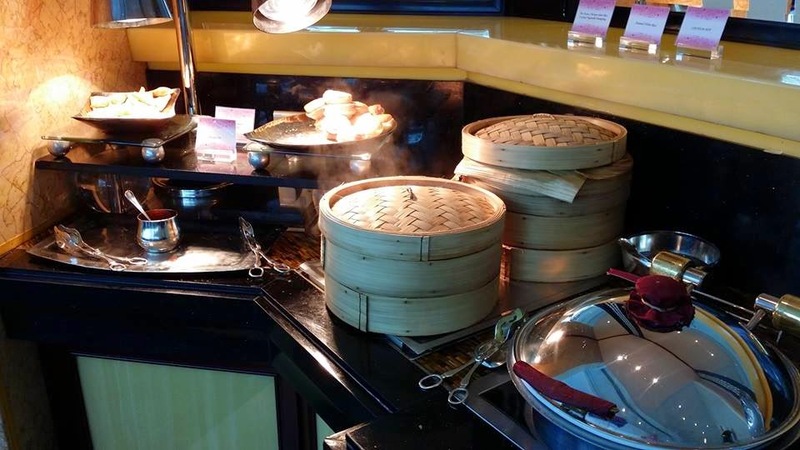 From dim sum, pork buns and sushi to finger sandwiches, individual quiches and individual glasses filled with caesar salad – oh, and not forgetting the Turkey station, laksa and curry dishes. There really was something for everyone. A wide choice of sandwich fillings. The sandwich selection was a nice change with traditional egg mayo and chive sitting prettily next to funky eggplant, sundried tomato and arugula. Some of them were open sandwiches, some were dainty little triangles. I tried the shredded smoked chicken with avocado and the egg mayo – both hit the spot perfectly. Whilst you are eating the staff come round with taster dishes too. We were offered a cold soup – similar to gazpacho, but it wasn’t to my taste. 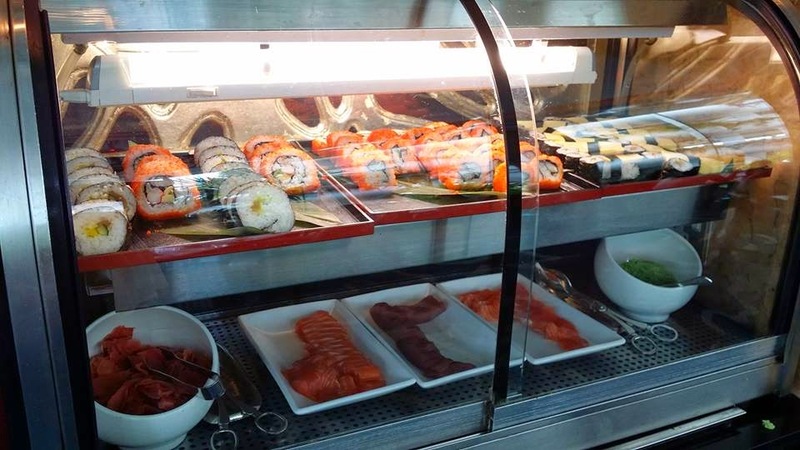 The sushi bar was easy to miss. There was so much to choose from with lunch it’s tempting to eat too much and not leave room for the desserts. Now that WOULD be a big mistake. Just from looking at the selection you could tell it was going to be good – and it didn’t disappoint. Where to start? The chocolate fountain with fruit kebabs? A perfectly sliced piece of cake? The trays of macaroons? An individual pot of yummy looking mousse? Some ice cream with one of the many toppings? So many cakes, so little time. 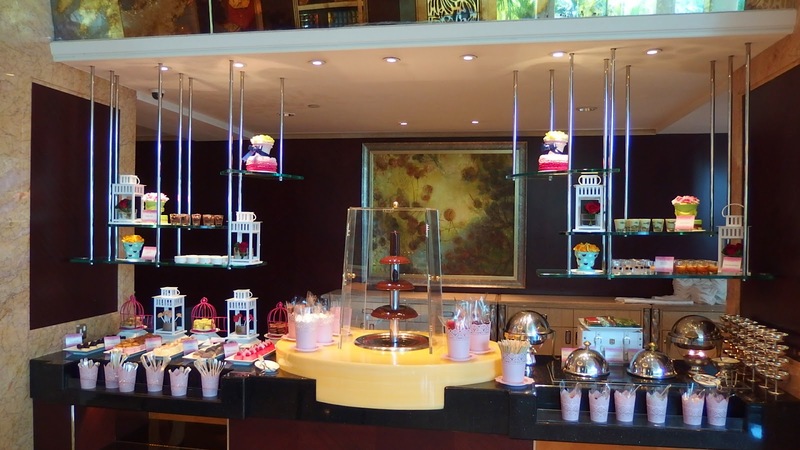 Everything is prettily displayed with a chocolate fountain taking centre stage. In the end I opted for the daddy of all desserts at afternoon tea – the scones. Hidden under a silver turin the scones were bite-size pieces of heaven. With the choice of plain or raisin I had to try both (I owe you that much right?) along with a generous dollop of jam and cream. They were delicious. All of those who had them agreed they were sooo good. I also tried the chocolate cupcakes which were moist and rich and the creme brûlée which had just the right crunch. One of us adored the tiramisu and there were noises coming from the lady eating the pumpkin and raspberry shortcake. Everyone found something they liked. All the cakes are pre-portioned on their own daily plate. All in all the selection, quality and quantity on offer was amazing. 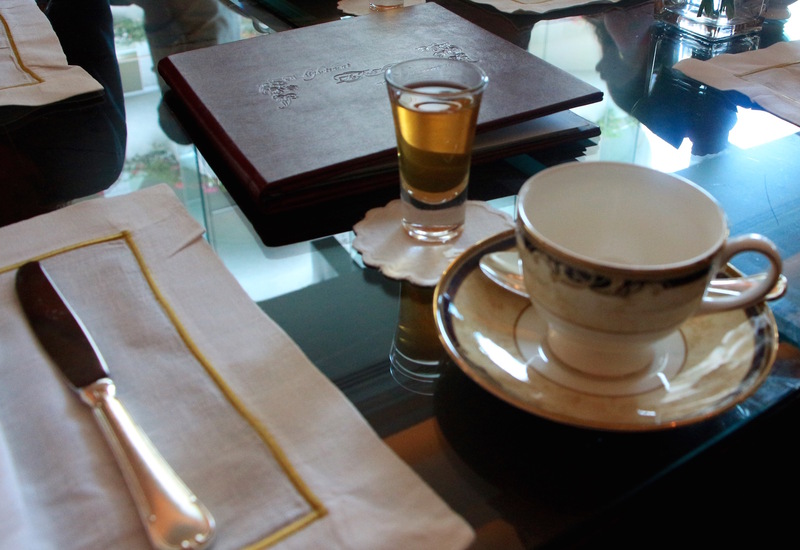 The beautiful china tea pots, the delicate cups, silver spoons and pretty napkins all added to the traditional ambience of the afternoon. The room was noisy enough to be able to have a good old natter and the big windows meant the room was full of light. A lovely final touch was when I was presented with a beautiful birthday cake, a signed card along with a photo of our group and a round of happy birthday. All quite unexpected as my birthday was the month before. It seems the original date (we had to postpone it previously) was my birthday and they’d taken note of it. Just what the Shangri-La do best; personal service. We were all having such a lovely time that before we knew it we were being asked to vacate the table (they have two sittings so you only have the table for a couple of hours). We decided rather than rush of we would head downstairs to the rather Lobby court and treat ourselves to a cocktail. A perfect end to a lovely afternoon. It was there we compared notes and agreed this was the best yet. We tried hard to criticise, but everything was just lovely. Our only complaint? The loos were too far away from the restaurant. But really, that was it. If you’re looking for a lovely setting, plenty of delicious, food to choose from and a comfy setting, this is your place. 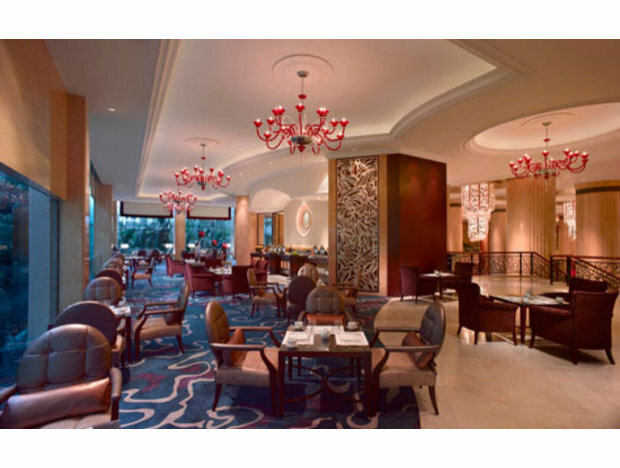 Thanks for sharing this information keep posting about high tea buffet catering in Singapore.